Waking up at 5:00 AM is the norm for us each day and with the promise of sunshine all day long I was really looking forward to getting an early start the second day of the festival. I knew the first thing to do was finish the yellow house from the previous rain-out. However, the art gods were working against me. After packing the truck, I discovered the exhaust pipe had broken in two and it sounded like a motorcycle gang warming up a dozen Harleys. So, instead of capturing the light that morning, I had to wait and capture a garage full of sleepy eyed mechanics at the shop. Luckily they could weld the pipe back together and I was off before 10AM. 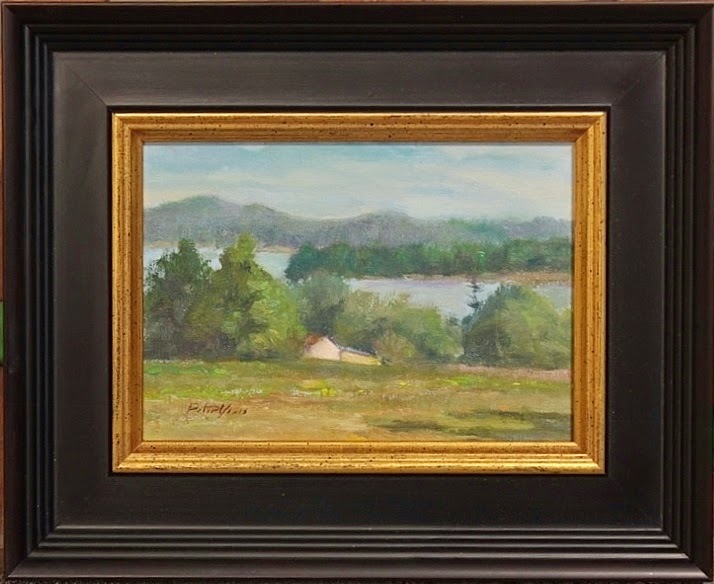 By the time I arrived it was too late to paint the yellow house so I found this little view. It's called the thimble house because way back in time, a writer purchased the property and the very large house that went with it. But this author was reported to be a very tiny person. So she lived and worked in this little shack because she was so small. After lunch I completed the roses. This photo is the first day's progress. I had framed the painting the night before and worked on it with the frame attached... very daring. 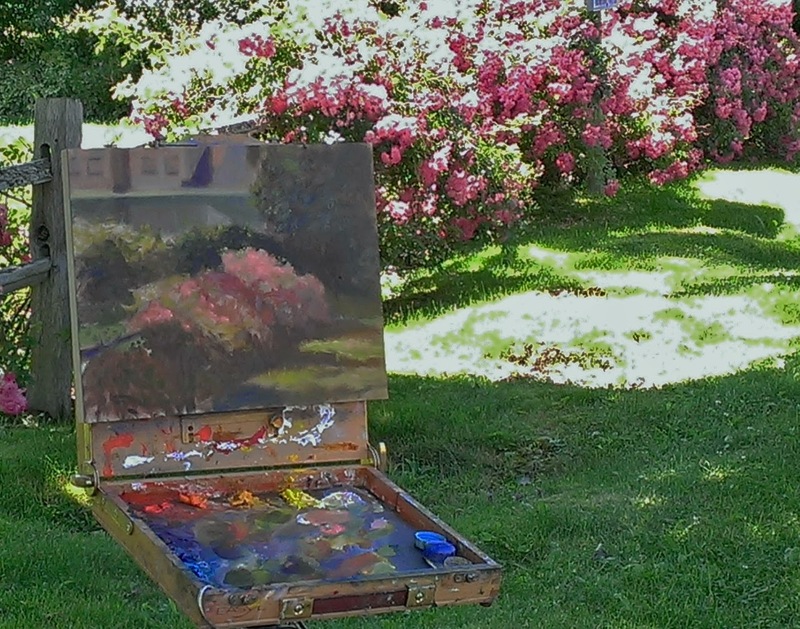 I had finished my painting and was packing up just as another artist wanted to paint the same scene. 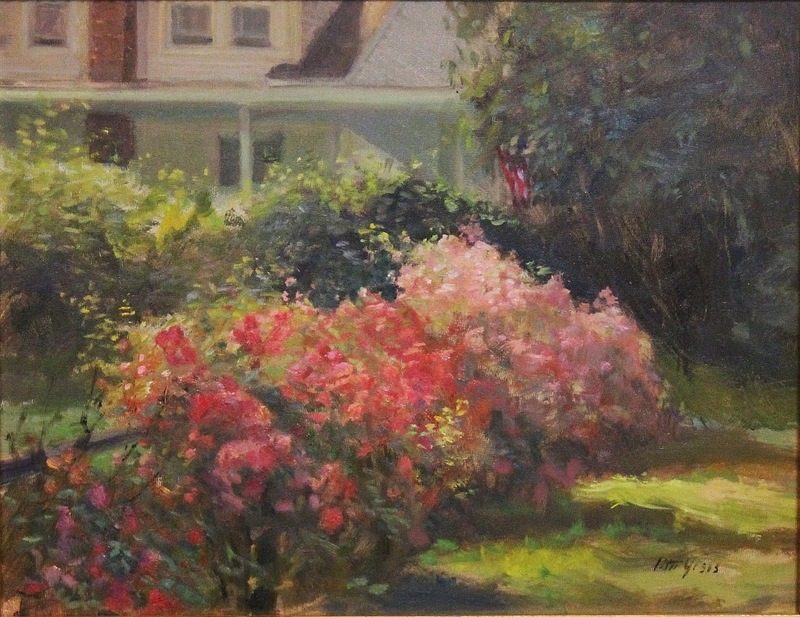 I thought it was great to see what she would do, so I simply moved over a few feet and turned to paint the porch side of the same house and the hydrangea bushes. We had so much fun... she eventually bought the painting. The festival scheduled a get-together cocktail party on the second day for the sponsors, hosts, and artists. ( just at the perfect time to catch the late afternoon light) So, after a brief walk and talk and munching on some tasty h'orderves, I headed out for one last painting of the day.